In pulmonary arterial hypertension (PAH), severe vasoconstriction and remodelling of small pulmonary arteries result in high mortality. Receptor tyrosine kinases and their ligands, such as transforming growth factor (TGF)-α, modulate proliferation in PAH. Although the receptor tyrosine kinase c-Kit has been shown to be overexpressed in PAH, the expression and role of its ligand stem cell factor (SCF) remain unknown. However, low plasma SCF levels are known to be linked to higher cardiovascular mortality risk. Using proximity extension assays, we measured SCF and TGF-α in venous plasma from treatment-naïve PAH patients and healthy controls. Patients were stratified into risk classes based on PAH guidelines. Plasma SCF was decreased (p=0.013) and TGF-α was increased (p<0.0001) in PAH patients compared to controls. SCF correlated to pulmonary vascular resistance (r=−0.66, p<0.0001), cardiac index (r=0.66, p<0.0001), venous oxygen saturation (r=0.47, p<0.0008), mean right atrial pressure (r=−0.44, p<0.002) and N-terminal pro-brain natriuretic protein (r=−0.39, p<0.006). SCF was lower in “high-risk” compared to “intermediate-risk” (p=0.0015) or “low-risk” (p=0.0009) PAH patients. SCF and TGF-α levels combined (SCF/TGF-α) resulted in 85.7% sensitivity and 81.5% specificity for detecting high-risk patients (p<0.0001). 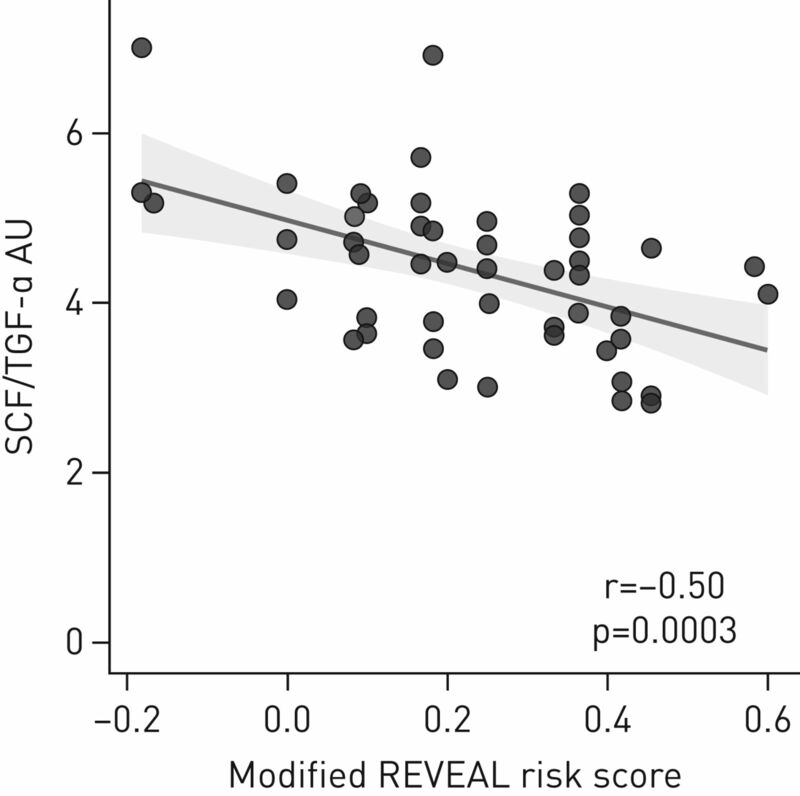 Finally, REVEAL (Registry to Evaluate Early and Long-Term Pulmonary Arterial Hypertension Disease Management) risk scores in PAH patients correlated to SCF/TGF-α levels (r=−0.50, p=0.0003). In conclusion, low plasma SCF combined with high TGF-α identifies high-risk PAH patients at baseline. 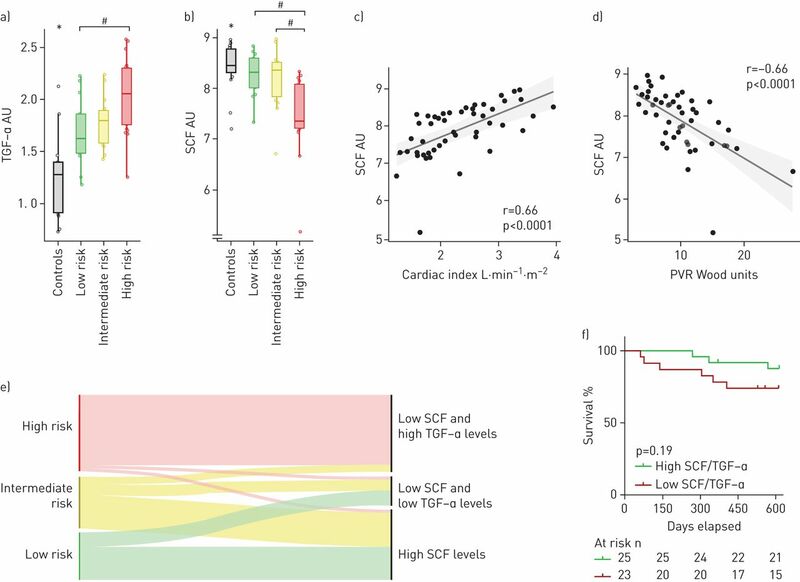 Lower circulating SCF levels, which are associated with worse haemodynamics, may be related to the c-Kit accumulation previously observed in PAH. In pulmonary arterial hypertension (PAH), progressive vasoconstriction and remodelling of distal pulmonary arteries result in right ventricular failure and a diminished life quality. These arteries manifest with intimal thickening and fibrosis, medial hypertrophy, adventitial reconstruction and formation of complex lesions . Many intriguing molecular domains have been linked to remodelling in PAH, including receptor tyrosine kinases and their ligands [2–9]. For instance, transforming growth factor (TGF)-α, an epidermal growth factor receptor (EGFR) ligand, is suggested to disturb pulmonary vascular development and promote pulmonary arterial remodelling in pulmonary hypertension . Fibroblast growth factor-2 is associated with pulmonary artery smooth muscle cell proliferation and is increased in blood samples from PAH patients [2, 11]. However, hepatocyte growth factor (HGF) and vascular endothelial growth factor (VEGF)-A, which are also upregulated in blood samples from PAH patients, are suggested to exert protective effects in PAH [4–6, 12–14]. Finally, although the role for stem cell factor (SCF), a ligand for the receptor tyrosine kinase c-Kit , remains unclear in pulmonary hypertension, c-Kit+ progenitor cells are known to accumulate in remodelled vessels in PAH . However, high plasma SCF has been shown to be associated with a lower risk of cardiovascular events and death . PAH patients are known to exhibit poor survival rates. Risk stratification, according to the 2015 European Society of Cardiology (ESC)/European Respiratory Society (ERS) PAH guidelines , has been validated to be effective for predicting patient mortality [18–20]. The present study investigated several receptor tyrosine kinases and related ligands in plasma from treatment-naïve PAH patients, in relation to risk classification, haemodynamics and biomarker response after treatment initiation. As receptor tyrosine kinase signalling is known to modulate cellular proliferation in pulmonary arteries, we hypothesised that some plasma proteins in these signalling cascades could reflect haemodynamics and stratify disease risk in PAH patients. 48 treatment-naïve PAH patients (aged ≥18 years), who were diagnosed using right heart catheterisation between September 2011 and September 2016 at the Hemodynamic Lab at Skåne University Hospital (Lund, Sweden), were included. The study group encompassed 21 idiopathic PAH (IPAH), two familial PAH (FPAH), 21 systemic sclerosis (SSc)-associated PAH and four other connective tissue disease (CTD)-associated PAH patients. IPAH and FPAH subgroups were treated as one entity, referred to as IPAH/FPAH. SSc-PAH and other CTD-PAH were regarded as another entity, referred to as CTD-PAH. During right heart catheterisations, venous blood from patients was obtained from the introducer placed in the internal jugular vein. 33 of these patients had follow-up blood samples after receiving PAH-specific therapy. Peripheral venous blood was obtained from 16 control subjects, devoid of pulmonary hypertension and considered healthy. All subjects received oral and written information regarding the purpose of the blood sampling and gave their written consent to participate. The study was approved by the local ethics board in Lund (Dnr 2015/270, Dnr 2011/777, Dnr 2011/368, Dnr 2010/114 and Dnr 2010/442). World Health Organization (WHO) functional class (FC), 6-min walking distance (6MWD), N-terminal pro-brain natriuretic peptide (NT-proBNP), mean right atrial pressure (mRAP), cardiac index (CI) and mixed venous oxygen saturation (SvO2) were used to stratify patients at baseline into “low-risk”, “intermediate-risk” or “high-risk” groups. Each parameter was graded with a score from 1 to 3, according to the cut-offs provided in the risk assessment instrument from the 2015 ESC/ERS PAH guidelines , where 1 corresponded to “low”, 2 to “intermediate” and 3 to “high” risk, as described by Kylhammar et al. . In the present study, the most commonly occurring score among the six parameters defined the patient's risk class. If the scores were equally represented in a patient, a mean of all variables were calculated and rounded off to the nearest integer, which defined the patient's risk group, as described by Kylhammar et al. . 10 patients had one missing parameter, and one patient had two missing parameters. In addition, we calculated the REVEAL (Registry to Evaluate Early and Long-Term Pulmonary Arterial Hypertension Disease Management) risk score (RRS) for all patients using the point assignment system provided in the RRS algorithm . Bearing in mind that some patients have a few missing values, we calculated a “modified RRS” using a mean of available points and didn't include the always-assigned six points in the original RRS algorithm. Renal insufficiency was defined as plasma creatinine >120 µmol·L−1. For additional data related to the RRS parameters in the present study population, refer to online supplementary table S1. Plasma was extracted and stored at −80°C in the Lund Cardio Pulmonary Register cohort of Region Skånes biobank. Proseek multiplex CVD II, CVD III and oncology II 96-plex proximity extension assay (PEA)-based immunoassays (Olink Proteomics, Uppsala, Sweden) were used for all the present biomarkers. Plasma levels were assessed using a PEA technique, which has previously been described in detail . In brief, oligonucleotide-labelled antibody pairs are used to detect targeted biomarkers, in order to avoid unspecific antibody binding and potential cross-reactivity events. As two related probes are brought in close proximity the oligonucleotides hybridise in a pair-wise manner. DNA polymerase addition results in a proximity-dependent DNA polymerisation event, creating a unique PCR target sequence. The DNA sequence is then detected and quantified using a microfluidic real-time PCR instrument (Biomark HD; Fluidigm, San Francisco, CA, USA). Data quality control and normalisation is performed utilising an internal extension control and an inter-plate control, in order to adjust for intra- and inter-run variation. Assay validation data and panel information are available at www.olink.com. The proteins assessed were amphiregulin, epidermal growth factor (EGF), EGFR, HGF, human EGFR (HER)-2, -3 and -4, placenta growth factor (PlGF), proheparin-binding EGF-like growth factor, SCF, TGF-α, VEGF-A, VEGF-D as well as VEGF receptors (VEGFR)-2 and -3. NT-proBNP was also measured using the PEA technique. However, the NT-proBNP used for patient risk stratification was extracted from medical journals, and was analysed using electro-chemiluminescence immunoassays. In the proseek multiplex oncology II analyses, one control sample and one IPAH follow-up sample did not pass the analysis quality requirements and were excluded. In the CVD II panel, one IPAH and one SSc-PAH patient baseline and follow-up samples were excluded for the same reason. Biomarkers are presented in normalised protein expression values, which is an arbitrary unit (AU) on a log2 scale. Right heart catheterisations were performed using Swan-Ganz catheters. Cardiac output was measured using thermodilution. Haemodynamics, 6MWD, SvO2 and WHO-FC were extracted from medical records. Body surface area (BSA), mRAP, diastolic pulmonary artery pressure, mean arterial pressure (mAP), mean pulmonary artery pressure (mPAP), pulmonary artery wedge pressure (PAWP), heart rate (HR) and cardiac output (CO) were used to calculate CI, stroke volume index (SVI), pulmonary vascular resistance (PVR), systemic vascular resistance (SVR), right (RVSWI) and left (LVSWI) ventricular stroke work indexes, according to the formulae CI = CO/BSA, SVI = (CO/HR)/BSA, PVR = (mPAP – PAWP)/CO, SVR = (mAP – mRAP)/CO, RVSWI = (mPAP – mRAP) × SVI and LVSWI = (mAP – PAWP) × SVI. t-tests and the Mann–Whitney U-test were used to evaluate differences between baseline biomarker values in patients versus control subjects. Levene's test was used to detect unequal sample variances. In addition, differences in biomarker values in IPAH/FPAH versus CTD-PAH subgroups were assessed using these tests. Biomarkers, haemodynamics, SvO2 and 6MWD were compared between baseline and follow-up with a paired t-test or a Wilcoxon signed-rank test. The Benjamini–Hochberg procedure was used to assess false discovery rate (FDR) for the statistical tests comparing PAH patients to controls. Biomarkers that were present more than once in all three panels were excluded. This rendered 273 as the total number of statistical tests. Correlations between baseline biomarkers and baseline mRAP, right ventricular systolic pressure (RVSP), CI, PVR, SvO2, 6MWD and NT-proBNP were assessed using Pearson's or Spearman's correlations. Correlations between biomarker changes (Δ between baseline and follow-up) and PVR changes were also calculated. SCF changes were additionally tested against changes in mRAP, RVSP, CI, SvO2, 6MWD and NT-proBNP. Finally, the correlation between the calculated “modified RRS” and a SCF/TGF-α ratio was assessed. Kruskal–Wallis and Dunn's tests were used to compare plasma SCF and TGF-α between PAH risk groups. To assess the performance of SCF and SCF/TGF-α as predictors of high-risk PAH, the area under the curve (AUC) of the receiver operating characteristics (ROC) was calculated. The best cut-off was determined according to Youden's index. The plasma SCF and TGF-α combination pattern in high-risk PAH patients was detected using decision tree analysis and verified using Fisher's exact test. Survival was analysed using the Kaplan–Meier method and differences between groups were assessed using the log-rank test. All patients were observed for 20 months and were censored at the end of this period or at lung transplantation. Statistical significance was defined as p<0.05. All values are presented as median (interquartile range), unless otherwise stated. Statistics were performed using R 3.4.3 (R Foundation for Statistical Computing, Vienna, Austria) or GraphPad Prism (Version 7; GraphPad Software, La Jolla, CA, USA). The rpart package was used for the decision tree analysis. Rawgraphs.io was used to create the alluvial plot in figure 1. Compared to controls, a) plasma transforming growth factor (TGF)-α is increased, and b) stem cell factor (SCF) is decreased in treatment-naïve pulmonary arterial hypertension (PAH) patients; b) SCF is lower in high-risk compared to intermediate- or low-risk PAH groups. SCF is correlated with haemodynamics, including c) cardiac index and d) pulmonary vascular resistance (PVR). e) Low SCF (<8.25 AU) combined with high TGF-α (≥1.64 AU) identified most high-risk PAH patients. f) Patients having low SCF/TGF-α ratio (≤4.4) showed a trend for worse survival compared to those with a high ratio (>4.4). Patients were risk classified according to the 2015 European Society of Cardiology/European Respiratory Society PAH guidelines. AU: arbitrary units. *: p<0.05 comparing all PAH patients pooled versus controls; #: p<0.05 comparing marked groups. Baseline and follow-up characteristics are provided in table 1. The time from baseline to clinical follow-up was 116 (90–127) days. At follow-up, patients were on monotherapy with either bosentan (n=5), macitentan (n=4), ambrisentan (n=7), sildenafil (n=4) or tadalafil (n=2) or combination therapy with bosentan and sildenafil (n=1), macitentan and sildenafil (n=2), macitentan and tadalafil (n=1), macitentan, tadalafil and treprostinil (n=1), ambrisentan and sildenafil (n=1) or ambrisentan and tadalafil (n=3). Among these, some had nifedipin due to rheumatologic symptoms during both baseline and follow-up (n=9) or only at baseline (n=1). Acute vasoreactive patients were on either nifedipin alone (n=1) or nifedipin and macitentan (n=1). Plasma SCF was decreased in PAH patients compared to healthy controls (p=0.013) (unadjusted p<0.005) (table 2). Baseline SCF correlated to baseline PVR (r=−0.66, p<0.0001), CI (r=0.66, p<0.0001), SvO2 (r=0.47, p<0.0008), mRAP (r=−0.44, p<0.002), NT-proBNP (r=−0.39, p<0.006), RVSP (r=−0.32, p<0.03) and 6MWD (r=0.32, p<0.03). Plasma SCF was lower in the high-risk group compared to the intermediate- (p=0.0015) or low-risk groups (p=0.0009) (Kruskal–Wallis p=0.0001) (figure 1b). However, plasma SCF did not discriminate between the low- and intermediate-risk groups (p=nonsignificant). ROC analysis for plasma SCF resulted in an AUC of 0.861 (95% CI 0.757–0.964, p<0.0001), with a sensitivity of 95.2% and specificity of 66.7% for high-risk PAH using a cut-off of 8.26 AU. Decision tree analysis on studied biomarkers, comparing the high-risk group versus pooled intermediate- and low-risk groups, showed that a combination of plasma SCF <8.25 AU and TGF-α ≥1.64 AU identified 19 high-risk patients and two low–intermediate-risk patients, whereas other biomarker level combinations (SCF ≥8.25 or SCF <8.25 AU with TGF-α <1.64 AU) identified 25 low–intermediate- and two high-risk patients (verified using Fisher's exact test, p<0.0001) (figure 1e). ROC analysis for SCF/TGF-α resulted in an AUC of 0.871 (95% CI 0.762–0.980, p<0.0001), with a sensitivity of 85.7% and specificity of 81.5% for high-risk PAH using a 4.4 AU cut-off. Patients having a SCF/TGF-α ≤4.4 showed a trend for worse survival compared to those with >4.4 (p=0.190) (figure 1f). However, when observing SCF alone, low (≤8.26) compared to high (>8.26) plasma levels did not show an equally solid trend for difference in survival (p=0.29) (data not shown). The “modified RRS” correlated to SCF/TGF-α (r=−0.50, p=0.0003), but not to plasma SCF alone (r=−0.22, p=0.13) (figure 2). The modified REVEAL (Registry to Evaluate Early and Long-Term Pulmonary Arterial Hypertension Disease Management) risk score correlated with a stem cell factor (SCF)/transforming growth factor (TGF)-α ratio. AU: arbitrary units. SCF increased in PAH patients between baseline and follow-up (p<0.006). SCF changes correlated to changes in PVR (r=−0.6, p<0.0004), NT-proBNP (r=−0.38, p<0.04) and 6MWD (r=0.5, p<0.007) (figure 3). Between baseline and follow-up, a trend for a larger increase in SCF was observed in patients improving in their ESC/ERS risk classification, compared to those remaining in the same risk class (p=0.23) (data not shown). Finally, IPAH/FPAH patients had lower plasma SCF compared to CTD-PAH (p<0.02) (table 2). a) Plasma stem cell factor (SCF) increased after initiating pulmonary arterial hypertension (PAH)-specific therapy; between baseline and follow-up, changes in SCF (ΔSCF) correlated with changes in b) pulmonary vascular resistance (ΔPVR) and c) 6-min walking distance (Δ6MWD). *: p<0.05 comparing PAH at baseline versus follow-up. Plasma TGF-α was increased in PAH compared to controls (p<0.0001) (table 2). Baseline TGF-α correlated with baseline NT-proBNP (r=0.55, p<0.0001), 6MWD (r=−0.43, p<0.003), mRAP (r=0.42, p<0.004), SvO2 (r=−0.41, p<0.004) and CI (r=−0.38, p<0.009). TGF-α was higher in the high-risk group compared to the low- (p=0.0089), but not the intermediate-risk group (p=0.08) (Kruskal–Wallis p=0.0063) (figure 1a). Amphiregulin was increased in PAH compared to controls (p<0.0001). Baseline amphiregulin correlated to baseline 6MWD (r=−0.5, p<0.0005), SvO2 (r=−0.38, p<0.008), NT-proBNP (r=0.37, p<0.01) and mRAP (r=0.35, p<0.02). Amphiregulin changes, between baseline and follow-up, correlated to changes in PVR (r=0.42, p<0.02). EGFR (p<0.0001), HER-3 (p<0.03) and EGF (p<0.04) were decreased in PAH compared to controls (table 2). Baseline HER-3 correlated to baseline RVSP (r=−0.32, p<0.03). HER-4 (p<0.003) decreased between baseline and follow-up. In PAH patients compared to controls, VEGF-A (p<0.0003), VEGF-D (p<0.0008) and PlGF (p<0.0001) were increased, whereas VEGFR-2 (p<0.004), but not VEGFR-3 (p=nonsignificant), was decreased. However, VEGFR-3 decreased between baseline and follow-up (p<0.0006) (table 2). Baseline correlations were found between VEGF-A and PVR (r=−0.29, p<0.05), VEGF-D and NT-proBNP (r=0.29, p<0.05) and VEGFR-2 and NT-proBNP (r=−0.34, p<0.02) as well as VEGFR-3 and RVSP (r=−0.31, p<0.04). PlGF changes, between baseline and follow-up, correlated to changes in PVR (r=0.37, p<0.05). Finally, VEGF-A was higher in CTD-PAH patients compared to IPAH/FPAH patients (p<0.02). Plasma HGF was increased in PAH patients compared to controls (p<0.0001). Baseline HGF correlated to baseline mRAP (r=0.43, p<0.003), NT-proBNP (r=0.40, p<0.006), 6MWD (r=−0.38, p<0.01) and SvO2 (r=−0.33, p<0.03). PAH patients suffer from dyspnoea, reduced quality of life and declined right ventricular function. Novel biomarkers for assessing prognosis could improve patient care and the current unsatisfactory survival rates. In the present study, we found that plasma SCF was reduced in PAH, and correlated to haemodynamics, SvO2, NT-proBNP and 6MWD. SCF was lower in high-risk compared to intermediate- and low-risk groups, but could not differentiate between the last-mentioned two groups. Low SCF combined with high TGF-α identified most high-risk PAH patients. SCF/TGF-α correlated to the modified RRS calculated in our patients. Finally, patients having a low SCF/TGF-α ratio showed a trend for worse survival. SCF is a ligand for the receptor tyrosine kinase c-Kit, and has crucial roles in cellular survival and proliferation, haematopoiesis, fertility and pigmentation . The exact role of SCF in PAH remains unknown, but c-Kit+ progenitor cells are known to accumulate in remodelled vessels of PAH patients . This could influence vascular remodelling, although the exact mechanisms remain elusive . Moreover, plasma-soluble c-Kit has been found to be increased in PAH patients . Notably, a study from Young et al. showed that SCF/c-Kit signalling inhibition reduces pulmonary vascular remodelling in mice models of chronic hypoxia. Additionally, low plasma SCF is reported in patients with other cardiovascular diseases and is associated with increased risk of cardiovascular events and death [16, 24]. While SCF may be affected by other cardiovascular comorbidities present in our study population, its correlation to several PAH-related parameters, together with the research previously done on c-Kit in pulmonary hypertension, point towards a role for this protein in pulmonary arterial remodelling. We hypothesise that low circulating SCF could be related to c-Kit accumulation in local tissue, and that the correlations between SCF and clinical parameters may reflect the severity of c-Kit imbalance in PAH. Finally, we observed that plasma SCF increased slightly at follow-up, after PAH treatment initiation, where poor SCF increases were associated with poor improvements in PVR, NT-proBNP and 6MWD. To our knowledge, current PAH therapies have no known direct influence on receptor tyrosine kinases. The ErbB receptor family encompasses the transmembrane receptors EGFR, HER2, HER3 and HER4, which play prominent roles in the transmission of critical cascades that drive tumour growth . In the present plasma analyses, significant decreases in EGFR and HER3 were observed. Findings from a previous PAH study showed that some EGFR inhibitors reduced RVSP and right ventricular hypertrophy, and attenuated, to some extent, pulmonary arterial remodelling in monocrotaline rat models . Another study showed that EGFR inhibition induced smooth muscle cell apoptosis and regressed medial thickness in a pulmonary artery organ culture . Among the EGFR ligands measured in the present study, TGF-α is particularly interesting. TGF-α plasma levels were increased in our PAH population and could identify high-risk patients when combined with SCF levels. A study from Le Cras et al. showed that TGF-α transgenic mice manifested with disturbed pulmonary vascular development as well as pulmonary arterial remodelling and hypertension. Interestingly, reduced lung VEGF-A protein levels were suggested to play a potential role in the pulmonary hypertension pathogenesis seen in these TGF-α mice . VEGF-A is a potent angiogenic factor, which is overexpressed in blood samples from PAH patients [12, 13]. However, its overexpression has been shown to protect against pulmonary hypertension in monocrotaline and hypoxia animal models [4, 5]. Moreover, VEGF-A has been demonstrated to decrease endothelin-1 in microvascular endothelial cells  and to induce vasorelaxation in neonate piglet pulmonary circulation . In accordance to these studies, blocking VEGF receptors through the tyrosine kinase inhibitor sugen (or SU5416), in combination with chronic hypoxia, results in severe pulmonary hypertension in rats . This animal model, known as the sugen chronic hypoxia rat model, has not only been used in many experimental PAH studies, but has been used to question the tyrosine kinase dynamics in PAH [30, 31]. In the present analyses, we observed decreased plasma VEGFR2 and, as previously reported, increased plasma VEGF-A in PAH patients. In addition, we found increases in plasma VEGF-D levels, but unaltered plasma VEGFR3, in PAH patients compared to controls. HGF is a pluripotent mitogenic protein, whose expression in blood was found to be increased in the present as well as previous PAH populations . Nonetheless, this growth factor is suggested to have protective roles in PAH . For instance, Guo et al. showed that administration of bone marrow mesenchymal stem cells and HGF along with granulocyte colony-stimulating factor creates a synergic attenuation of PAH in rats. These counterintuitive observations of both protective effect and increased circulating levels of HGF are reminiscent of the increased circulating VEGF concentration, which could exert protective effects in PAH [4, 5]. Increased expression in circulating VEGF or HGF could reflect upregulated feedback mechanisms that recruit these potent angiogenic factors to form healthy vascular beds, and subsequently decrease vascular pressures. Some limitations should be considered when interpreting the results and the potential values of the biomarkers in this study. First, the study had a relatively small number of patients, since we only included treatment-naïve patients. In addition, the current investigation was retrospective, and future prospective studies will be of great value to assess the potential clinical value of combining SCF and TGF-α for risk assessment in PAH. Low plasma SCF combined with high TGF-α identifies high-risk treatment-naïve PAH patients. Low SCF levels are linked to worse baseline haemodynamics, SvO2, NT-proBNP and 6MWD, which may be related to the local c-Kit accumulation previously observed in PAH. Further studies are encouraged to assess the pathogenic role of SCF in PAH, and validate the role of SCF and TGF-α in risk assessment. We acknowledge the support of the staff at the Hemodynamic Laboratory, the Section for Heart Failure and Valvular Disease, Skåne University Hospital (Lund, Sweden), and at the Dept of Cardiology, Clinical Sciences Lund, Lund University (Lund). Specifically, we thank Anneli Ahlqvist for the support in assembling plasma samples for the Lund Cardio Pulmonary Register (LCPR). We acknowledge the biobank services and retrieval of blood samples from LCPR performed at Labmedicin Skåne, University and Regional Laboratories (Skåne, Sweden). Conflict of interest: H. Bouzina reports receiving grants from GlaxoSmithKline and Actelion Pharmaceuticals AB during the conduct of the study, and grants from the Swedish Society of Pulmonary Hypertension on behalf of GlaxoSmithKline and nonfinancial support from GlaxoSmithKline outside the submitted work. Conflict of interest: G. Rådegran reports receiving grants from GlaxoSmithKline and Actelion Pharmaceuticals AB during the conduct of the study, and personal fees from Actelion Pharmaceuticals Sweden AB, GlaxoSmithKline, Bayer HealthCare AB, NordicInfu Care and Sandoz/Novartis outside the submitted work. Support statement: The present work was supported by unrestricted research grants from Actelion Pharmaceuticals AB and GlaxoSmithKline. The foundations had no role in analysis, interpretation or publication of the manuscript. Funding information for this article has been deposited with the Crossref Funder Registry. Pathology of pulmonary hypertension. Clin Chest Med 2007; 28: 23–42. Endothelial-derived FGF2 contributes to the progression of pulmonary hypertension in humans and rodents. J Clin Invest 2009; 119: 512–523. PDGF-dependent β-catenin activation is associated with abnormal pulmonary artery smooth muscle cell proliferation in pulmonary arterial hypertension. FEBS Lett 2016; 590: 101–109. Cell-based gene transfer of vascular endothelial growth factor attenuates monocrotaline-induced pulmonary hypertension. Circulation 2001; 104: 2242–2248. Adenovirus-mediated lung vascular endothelial growth factor overexpression protects against hypoxic pulmonary hypertension in rats. Am J Respir Cell Mol Biol 2000; 23: 762–771. Hepatocyte growth factor improves the survival of rats with pulmonary arterial hypertension via the amelioration of pulmonary hemodynamics. Int J Mol Med 2011; 27: 497–502. Transforming growth factor alpha (TGFα) regulates granulosa cell tumor (GCT) cell proliferation and migration through activation of multiple pathways. PLoS One 2012; 7: e48299. C-kit-positive cells accumulate in remodeled vessels of idiopathic pulmonary arterial hypertension. Am J Respir Crit Care Med 2011; 184: 116–123. Disrupted pulmonary vascular development and pulmonary hypertension in transgenic mice overexpressing transforming growth factor-α. Am J Physiol Lung Cell Mol Physiol 2003; 285: L1046–L1054. Elevated basic fibroblast growth factor levels in patients with pulmonary arterial hypertension. Chest 2004; 126: 1255–1261. Circulating angiopoietins in idiopathic pulmonary arterial hypertension. Eur Heart J 2010; 31: 2291–2300. Growth factors and interleukin-6 across the lung circulation in pulmonary hypertension. Eur Respir J 2009; 34: 662–668. Utility of hepatocyte growth factor as a biomarker for early diagnosis of pulmonary artery hypertension. Mol Diagn Ther 2016; 20: 463–468.
. Stem cell factor receptor/c-Kit: from basic science to clinical implications. Physiol Rev 2012; 92: 1619–1649. Plasma stem cell factor levels are associated with risk of cardiovascular disease and death. J Intern Med 2017; 282: 508–521. A comprehensive risk stratification at early follow-up determines prognosis in pulmonary arterial hypertension. Eur Heart J 2017: doi: 10.1093/eurheartj/ehx257. Mortality in pulmonary arterial hypertension: prediction by the 2015 European pulmonary hypertension guidelines risk stratification model. Eur Respir J 2017; 50. 1700740. The REVEAL Registry risk score calculator in patients newly diagnosed with pulmonary arterial hypertension. Chest 2012; 141: 354–362. Homogenous 96-plex PEA immunoassay exhibiting high sensitivity, specificity, and excellent scalability. PLoS One 2014; 9: e95192. Antagonism of stem cell factor/c-kit signaling attenuates neonatal chronic hypoxia-induced pulmonary vascular remodeling. Pediatr Res 2016; 79: 637–646. Decreased levels of stem cell factor in subjects with incident coronary events. J Intern Med 2016; 279: 180–191.
. ERBB receptors: from oncogene discovery to basic science to mechanism-based cancer therapeutics. Cancer Cell 2014; 25: 282–303. Role of epidermal growth factor inhibition in experimental pulmonary hypertension. Am J Respir Crit Care Med 2010; 181: 158–167. Epidermal growth factor receptor blockade mediates smooth muscle cell apoptosis and improves survival in rats with pulmonary hypertension. Circulation 2005; 112: 423–431. Effects of vascular endothelial growth factor on endothelin-1 production by human lung microvascular endothelial cells in vitro. Life Sci 2014; 118: 191–194. Role of vascular endothelial growth factor receptor 1 and vascular endothelial growth factor receptor 2 in the vasodilator response to vascular endothelial growth factor in the neonatal piglet lung. Crit Care Med 2005; 33: 860–866.
. The role of vascular endothelial growth factor in pulmonary arterial hypertension. The angiogenesis paradox. Am J Respir Cell Mol Biol 2014; 51: 474–484. Tyrosine kinase inhibitors in pulmonary arterial hypertension: a double-edge sword? Semin Respir Crit Care Med 2013; 34: 714–724. The synergistic therapeutic effect of hepatocyte growth factor and granulocyte colony-stimulating factor on pulmonary hypertension in rats. Heart Vessels 2014; 29: 520–531.